In the brave new world of innovative tidal energy devices, Alstom reports its 1-megawatt turbine has lived up to its billing, reaching full nominal output after a series of gradual increases in power. The device is just one of several tidal hopefuls being put through its paces these days at the European Marine Energy Centre in Orkney, which has been aided in its wave and tidal energy testing leadership role by a newly extended pier that’s nearly a quarter-mile long and provides Scotland’s longest commercial deep-water berth. 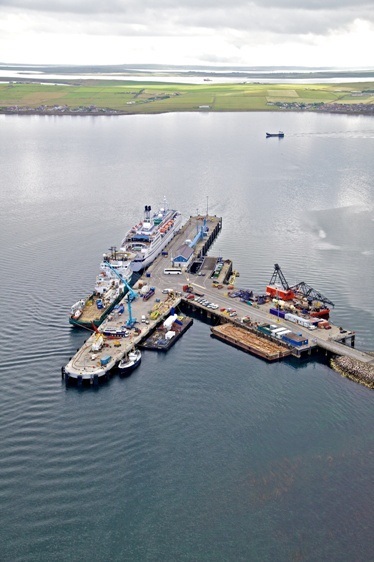 OpenHydro, Scotrenewables Tidal Power, ANDRITZ Hydro Hammerfest and Voith Hydro – in addition to Alstom – have all used the Hatston Pier in recent weeks, according to Orkney officials. Alstom’s tidal play is a horizontal-axis turbine, one that looks a lot like the big wind turbines that are churning out power around the world. With a rotor diameter of 18 meters, it was submerged on a tripod structure at a depth of 40 meters at the EMEC. The three blades on the turbine are pitchable (that is, the blades can be turned to change the rotation speed), and the turbine can rotate to face the incoming tide. “We are enthusiastic following the initial tests of our tidal stream turbine which successfully demonstrated the advantages of Alstom tidal turbine technology, in the challenging environment of the Fall of Warness in Orkney,” Alstom Ocean business Vice-President Rob Stevenson said in a statement. Tidal power – like wave – is a fascinating technology to keep an eye on these days because so many new ways of extracting energy from the sea are being floated (or submerged). 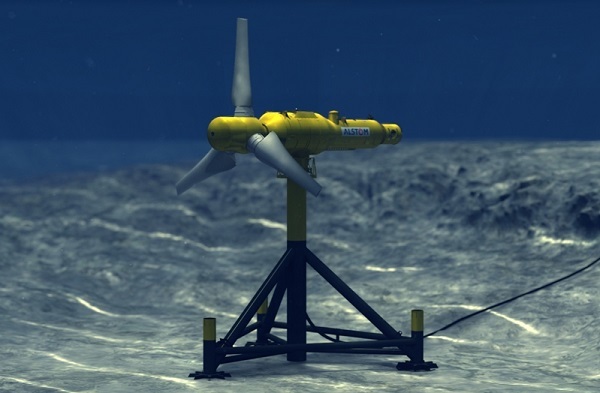 Companies, institutes, dreamers and schemers are offering up a panoply of visions, trying to find a way to make tidal power competitive, and many governments, especially Scotland, are encouraging the exploration. The next step of the testing program will be to demonstrate the full range of autonomous running capabilities of the turbine (its ability to efficiently operate independently), continue with the planned maintenance and gather evidence for certification. The endurance and reliability will also be tested into 2014. Tests in pilot farms will follow prior to the start of full commercial production. I love this idea of harnessing wave power. I hope that the environmental aspects of any interference with fish and marine mammal life is studied alongside these great ideas! We must have different solutions to the fossil fuel and nuclear industries. Glad to see these innovative ideas! All if these new technologies can be brought to bear to slow down the effects of climate change.